France's top constitutional authority says presidential archives on Rwanda should remain secret, thwarting a genocide researcher. 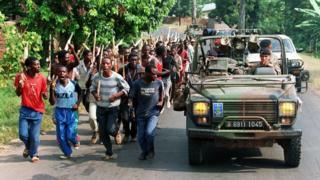 In 1994 France backed Rwanda's ethnic Hutu leaders at the time of the genocide by Hutu militias. Some 800,000 people - mostly Tutsis - were killed. The Constitutional Council says a 25-year block on ex-president François Mitterrand's documents is legitimate. A researcher, François Graner, had sought permission to study them. He argued that the rule keeping many government documents under wraps violated the public right of access to official archives - a right dating back to the 1789 French Revolution. He said he is prepared to take the case to the European Court of Human Rights. The restrictions on access to the presidential archives "are justified on the grounds of common interest and are proportional", the Council said in its ruling. The constitution says papers deposited in the archives by a president or minister can remain secret for 25 years after that person's death. Mitterrand was president from 1981 to 1995, and died in 1996. In April 2015, the French presidency announced that its archives on Rwanda for 1990-1995 would be declassified. François Graner then requested access to the Mitterrand archives, but was rebuffed. Mr Graner has written a book accusing French officers of helping the Hutu militias. Rwanda's President Paul Kagame, who took control after the genocide, has made similar allegations of French complicity. France denied any involvement in the killings. "It's obviously a cover-up," Mr Graner said. "There are political reasons for this decision." France had close military co-operation with the Rwandan military before the genocide erupted. The spark was the death of Rwandan President Juvénal Habyarimana, a Hutu, when his plane was shot down. During the 1994 killings, France sent a force to set up a supposedly safe zone. Critics accused France of not doing enough to stop the slaughter.